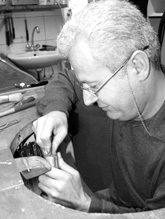 Erich Zimmermann Each and every piece of jewelry that leaves Erich Zimmermann's atelier in Augsburg has been crafted according to a design idea conceived by this jewelry designer, goldsmith and gemstone expert. The top priorities for him and his team are exceedingly high design standards and an uncompromising quality. Gitta Pielcke-Zimmermann Erich Zimmermann's wife shares the atelier with him. Under the name of Gitta Pielcke she produces her very own jewelry line - without being influenced by her husband's style but with equal success. Melek Tezel Atelier foreman Melek Tezel is responsible for ensuring the high level of craftsmanship required for implementing Erich Zimmermann's designs. Tezel is not only an excellent goldsmith himself but an equally qualified gemstone setter. Thanks to his dedicated commitment he imparts outstanding skills to Erich Zimmermann's apprentices. Three apprentices in succession finished their training with a grade "A". Lisa Kunzelmann With great success, apprentice Lisa Kunzelmann learns the goldsmithing trade in Erich Zimmermann's atelier. They both graduated as a journeyman/journeywoman goldsmith from Erich Zimmermann's atelier - both with grade "A" in the practical examination. By now, these two goldsmiths have successfully obtained their master goldsmith diploma and will soon open their own jewelry atelier in Görlitz.